Homemade Four Cheese Ravioli is the best dinner recipe! 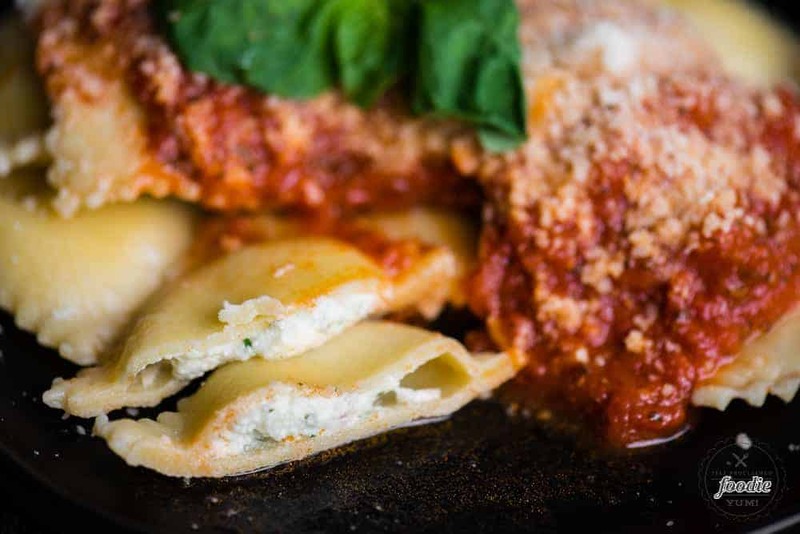 Flavorful Italian cheeses perfectly wrapped in homemade pasta dough is pure comfort food. 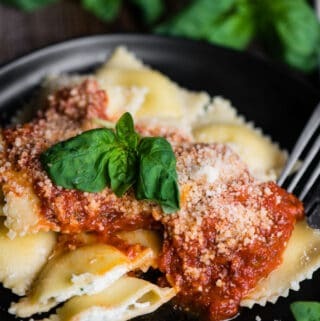 This might not be one of those quick weeknight recipes, but it certainly worth it and is better than any ravioli you’ll get in a restaurant! Similar to my homemade meat and cheese ravioli, this ravioli recipe is still made with my homemade pasta, but is a tasty vegetarian version! 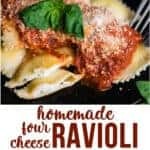 If you’ve never made your own homemade ravioli, then my Four Cheese Ravioli recipe will completely knock your socks off. A good, and I mean really good, ravioli recipe starts with homemade pasta sheets. If you’ve never made your own homemade pasta, I highly encourage you to try it! Not only does it taste better than anything you’ll find at the store, but it’s strangely satisfying to make. 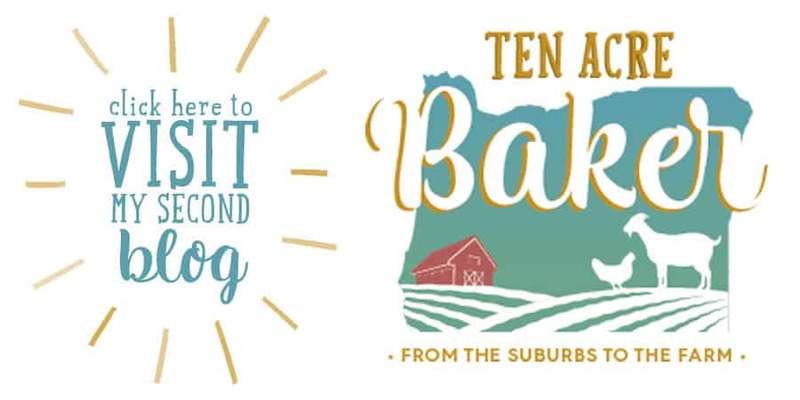 My pasta recipe uses equal amounts of semolina flour with all purpose flour, farm fresh eggs (I know this isn’t an option for everyone), and olive oil. My recipe is super easy to make, especially if you knead the dough in a stand mixer, and have a pasta roller to make thin uniform sheets. Next comes the filling. I like to use four different kinds of whole milk cheeses. They each add a little something as far as flavor and texture to the ravioli. I combine the cheeses with fresh basil, roasted garlic, and egg in a food processor to fully mix. All you need to do at this point is to fill and seal your ravioli. It’s much easier if you have a ravioli press, but it is entirely possible to fill homemade ravioli without any special tools or equipment. The main rule of thumb, however, is to be sure to NOT overfill your ravioli and to seal each one well. You don’t want any of that delicious filling to squeeze out when you’re boiling them. 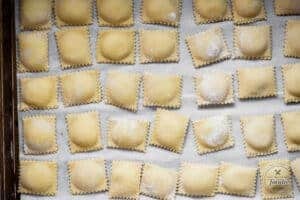 From there, you can either drop your cheese ravioli in some salted boiling water for a few minutes to cook, your you can freeze them for a future meal. How do you freeze homemade ravioli? Well, if you toss all of the fresh ravioli into a container and then into the freezer, you’ll end up with one large blog of squished up ravioli. Much like when you freeze fresh berries, you must place them on a baking sheet in a single layer before you freeze. I highly recommend lining your baking sheet with parchment paper first. It just makes it so that there’s no change the ravioli will stick. 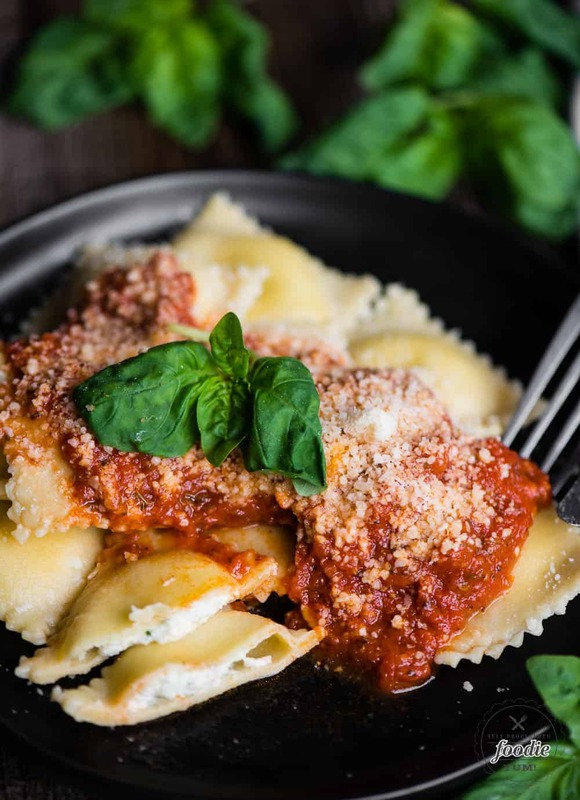 Once the ravioli are frozen solid, you can then combine them in a single container or plastic freezer back before you stick them right back in the freezer. No need to defrost before you cook, either. Just drop the frozen raviolis right into a pot of salted boiling water. They’re still done within just a few minutes and will float to let you know. It’s so easy to freeze ravioli that I highly recommend you make BIG batches and keep enough in your freezer to last you months. It makes a very quick and convenient meal! What do you serve with homemade cheese ravioli? First, we must discuss sauce. Ravioli, of any kind, need a good sauce. 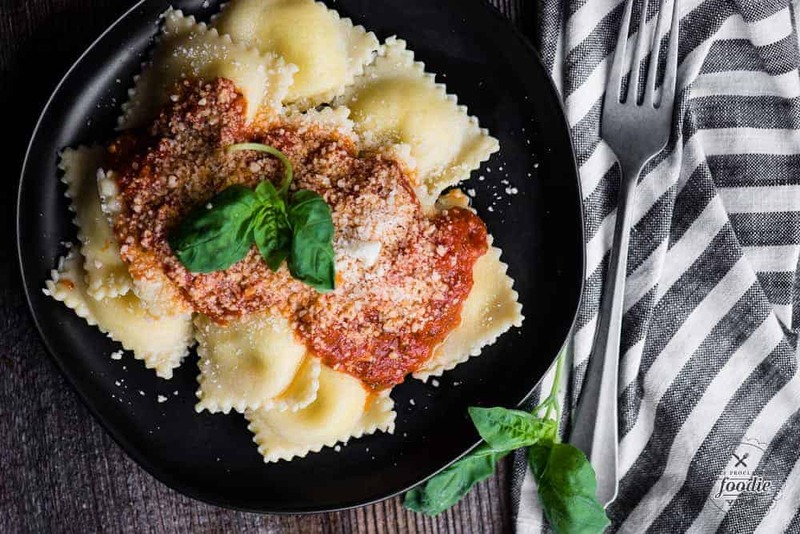 Whether you choose to make a brown butter sauce like I do for my butternut squash ravioli, or you choose a hearty tomato sauce like I typically do for my cheese ravioli, a good sauce will make all the difference. More freshly grated cheese is always a good thing. Always. From there, you can call it a day. Or, you can serve up some crispy homemade garlic bread and a nice ceasar salad. Oh, and don’t forget a big glass of red wine. YUM! Homemade Four Cheese Ravioli is the best dinner recipe! Flavorful Italian cheeses perfectly wrapped in homemade pasta dough is pure comfort food! Using a food processor, pulse the all of the ingredients together to fully mix. Boil the ravioli in plenty of salted water until just done. This will only take a short time! The ravioli will float on the surface of the water when they are finished. Carefully remove and drain. Serve with warm marinara sauce and a generous amount of grated Parmesan cheese.